Al Dente is the advisor of Empreror Fred and superior of our furry felines. Although they normally seek out their own adversary... No, let me rephrase that. Although their adversary usually seeks to confront the Pizza Cats, sometime they are sent on a mission by Al Dente. 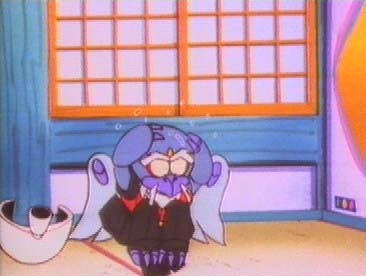 Bad Bird is the leader of the Ninja Crowes, and as such really dislikes the Pizza Cats. Bad Bird and Speedy are extremely competitive when they stand eye to eye. Bad Bird's father used to be a Superbad Bird ("The Nuclear Potato"), and Bad Bird hopes one day to be as bad as his father. Bat Cat is a member of the Rescue Team. He is sometimes called in by Francine when she thinks the Pizza Cats are in for more trouble than they can handle. Emperor Fred is a loony, who keeps repeating Fred. That is why Little Tokyo is governed by a council of wise men, not by him. He is a very colourful person who always finds new hobbies and always portrays a fresh look on things. Francine works behind the counter in the restaurant and announces the launch when the Pizza Cats go on a mission. Yet another member of the Rescue Team. Whenever the Pizza Cats are over their head into trouble, they call upon the Team to help them out. Although the Pizza Cats prefer hand to hand combat with their weapons, General Catton will not refrain from using heavy artillery (as in "The Great Golden Cluck"). This is the giant robot of the Pizza Cats. It stays on the top of Mount Coochi inside a giant cat statue. When the Pizza Cats are in trouble the Magical Ginzu Sword calls it and it flies in looking like a lion. It then fires the three Goonie Birds who transform the Pizza Cats so that they can fly. After that, the Supreme Catatonic transforms into a human and does battle with an enemy robot while being controled by Polly and Guido. [Gweedo Ancho'vee] Guido has a magical umbrella which is his trademark in the battle against evildoers. Guido is Speedy's best pal except when it comes to dating Lucille. The spiritual advisor to the Pizza Cats. He lives on top of a mountain. Whenever the Cats don't know what to do they visit Guru Lou, and he gives them advise, mostly to make them go away. Jerry is the Big Cheeses advisor and the brain behind many cunning plans to take over Little Tokyo. Underneath his helmet Jerry is bald, as can be seen in "Let the Cellar Beware". Both Speedy and Guido want Lucille to be their girlfriend and they can fight endlessly over it. Lucille can be very moody, which in her case means that several homing missiles are fired from her impressive hairdo. Ah well, it happens to all of us sometimes, eh? Meowzma (that is how the name sounds) is one of the four members of the Rescue Team (or B-team). He has buzz saw blades on his arms and a drill on his tail. His specialty is tunnelling though the ground. Whenever the Pizza Cats are launched, the scene switches to a mother and her child who place some corny remarks on the cats. The child calls his mother "Mama-san". We never get to see the narrator, we only get to hear his voiceover. He links the different scenes of the cartoon together and places some well thought comments. He thinks he's underpaid, but then again, he sometimes reads from the wrong scripts, so he had that coming. They are the ground troops of the Big Cheese, under command of Bad Bird. Although they are numerous, they seldom manage to win from the Pizza Cats. Must be their training budget. In "The Nuclear Potato" we see that Bad Bird and his brothers are mini-Ninja Crowes being trained by his father. Whether these relatives become the Ninja Crowes later remains unclear. Polly wields love as a weapon. She has heart-shaped throwing stars and razor sharp claws. Now there's one kitten not to touch without a glove! The princess is the daughter of the emperor of Little Tokyo. If she wants something, you'd better give it to her. She is a wee bit spoiled, but don't tell her I said that. The Big Cheese is the leader of the bad guys. Always planning to get Little Tokyo under his command. He has the tendency to explode when he does not get what he wants, which is quite often. In fact, his whole family has this nasty habit. [Speedy Sir Veejay] Speedy is the leader of the gang. He wields his Magical Ginzu Sword that can split into two swords with awesome destructive power. One of the four members of the Rescue Team. In "The Nuclear Potato", Spritz floods the attacking robots away with a powerful waterbeam.